On Monday, the BJP asked the Election Commission of India to prevent Mohmmad Akbar Lone from contesting in the elections for his alleged "pro-Pakistan slogans" at a campaign. फारुख अब्दुला श्रीनगर से चुनाव लड़ रहे हैं. 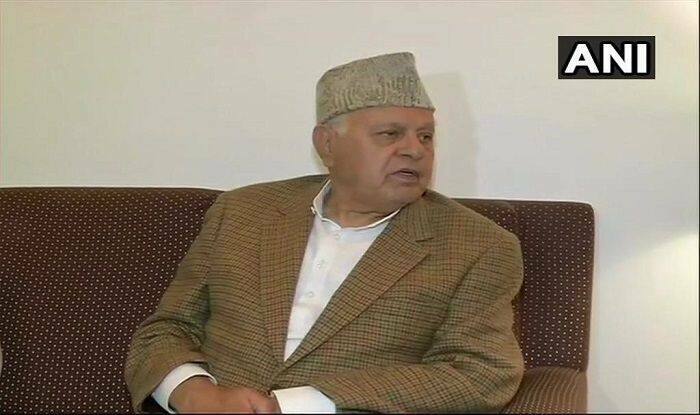 Vijayawada: National Conference president Farooq Abdullah yet again questioned the number of deaths in the Balakot air strike and alleged that the air strike was purposely carried out ahead of the Lok Sabha elections 2019 due to the absence of Modi wave in the country. “Had that been the picture (2014 like Modi wave) they would not have done Balakot. They think they have got the new lease of life because of Balakot. They tried to portray that we would kneel down Pakistan but instead lost their own aircraft,” said the former J&K Chief Minister. This comment comes just a day after a party candidate contesting from Baramulla constituency Mohammad Akbar Lone raised pro-Pakistan slogans. The NC leader had said that he will abuse those who hurl abuses at Pakistan. Reacting to the controversial statement, J&K BJP spokesman Altaf Thakur said that his party will approach the Election Commission urging them to nullify his candidature. Jammu and Kashmir’s six Lok Sabha seats will go to polls in five phases. Baramulla and Jammu constituencies will vote in the first phase. Srinagar and Udhampur constituencies will go to polls in the second phase. Anantnag constituency will go to polls in third, fourth and fifth phases. Ladakh will go to polls in the fifth phase. The counting of votes will take place on May 23.